Select IPA Server → Topology → Topology Graph. If you make any changes to the topology that are not immediately reflected in the graph, click Refresh. 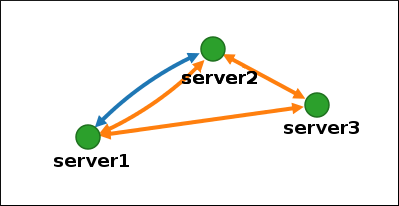 Servers joined in a domain replication agreement are connected by an orange arrow. 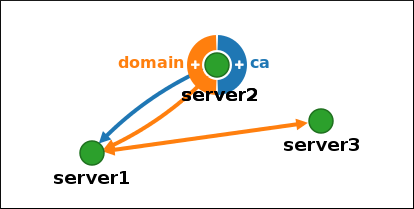 Servers joined in a CA replication agreement are connected by a blue arrow. 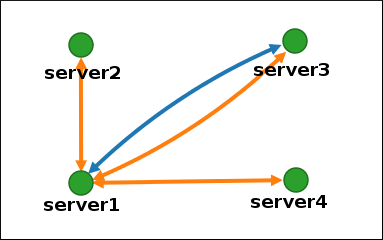 Figure 6.6, “Recommended Topology Example” shows one of the possible recommended topologies for four servers: each server is connected to at least two other servers, and more than one server is a CA master. In Figure 6.7, “Discouraged Topology Example: Single Point of Failure”, server1 is a single point of failure. All the other servers have replication agreements with this server, but not with any of the other servers. Therefore, if server1 fails, all the other servers will become isolated. Avoid creating topologies like this. For details on topology recommendations, see Section 4.2, “Deployment Considerations for Replicas”. In the topology graph, hover your mouse over one of the server nodes. Click on the domain or the ca part of the circle depending on what type of topology segment you want to create. A new arrow representing the new replication agreement appears under your mouse pointer. Move your mouse to the other server node, and click on it. In the Add Topology Segment window, click Add to confirm the properties of the new segment. Click on an arrow representing the replication agreement you want to remove. This highlights the arrow.